Since 1 July, thousands of Rotary members across the world have honored President Gary C.K. 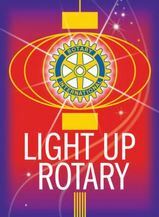 Huang’s call to Light Up Rotary through unique Rotary Day events in their local communities. These events range from family carnivals, to service projects at food pantries, to environmental projects, to pet-friendly events and more! Have a Rotary Day video you’d like to share? Upload it to YouTube and email rotary.service@rotary.org with a link to the video and a brief description of the event.